In a game that was closer than it maybe should have been in the first half, the Seahawks came out in the second half and proved they had more fire power than their opposition. The Seahawks defeated the Carolina Panthers 31-17 on Saturday night, advancing to their second straight NFC Championship Game next Sunday right here in Seattle. For the Panthers, their season is now over. In a big time game many Seahawks players stepped up in a big way. Here are my thoughts on Saturday’s win. Russell Wilson’s Best Game of the Year: Russell Wilson’s passer rating sums up the Seahawks offensive success in a nutshell. Wilson went 15/22 for 268 yards and 3 touchdowns Saturday night, on his way to a 149.2 passer rating; his best since posting a 127.3 passer rating week 5 against Washington. This win also marks the sixth time in the past 8 games that Wilson did not throw an interception. What may be even more impressive is that the Seahawks did not rely on Wilson’s feet to extend drives. His patience in the pocket and willingness to take shots down the field paid dividends in this game and the Carolina secondary had a difficult time stopping the Seahawks passing game, not necessarily because of the coverage they played but because Wilson was so pinpoint accurate hitting his receivers. With the Seahawks facing another young secondary next week I would expect Wilson and the Seahawks offense to formulate a similar game plan for the NFC Championship. Kearse Makes Significant Impact: The distribution of Russell Wilson’s passes was about as even as you could get, but wide receiver Jermaine Kearse played the most significant role in the passing game. Kearse led all Seahawks receivers with 129 receiving yards and a touchdown on 3 catches, the biggest of which coming on his one-armed touchdown grab for 63 yards with 4:54 remaining in the second quarter. As great as Kearse’s performance was on Saturday, we must look ahead to the role he must play next week now that we know Paul Richardson is out for the season with a torn ACL. Although Kearse is a starter and it would be expected that Ricardo Lockette will see more playing time next week, I would fully expect him to be Russell Wilson’s primary target next week, especially on deep passes. The Power of the Turkey Leg: In the fourth quarter I went down to the concourse and bought myself a “Bam Bam Kam turkey leg,” one of the new food items introduced for this year’s playoff run. I got the turkey leg, went back to my seat, started eating it, and within 5 minutes Kam Chancellor picked off a Cam Newton pass and returned it 90 yards for a touchdown. 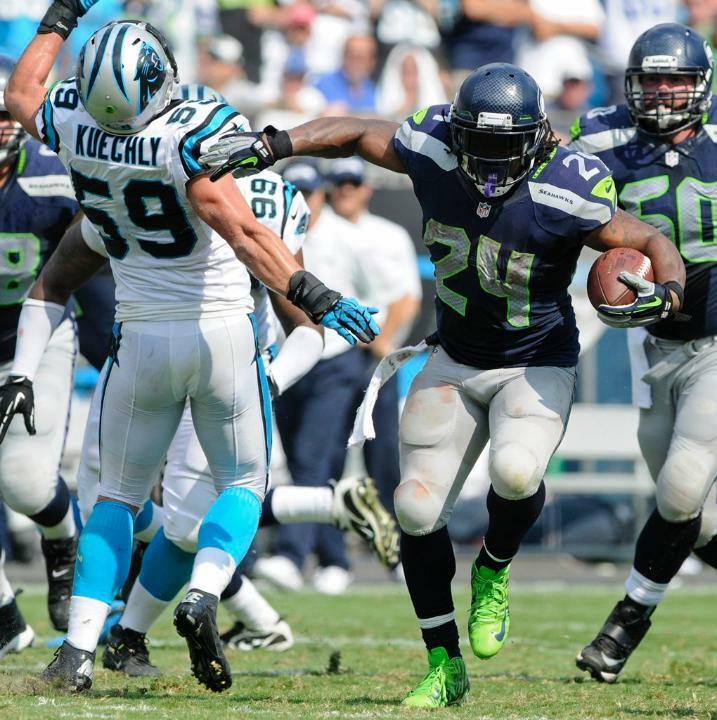 The score gave the Seahawks a 31-10 lead and any hope Carolina had of coming back was gone. Chancellor played as good of a game as I have ever seen him play, and he made a positive impact in multiple areas. In addition to the interception and touchdown, Chancellor co-led all Seattle defenders in tackles with 11 and recorded a pass defensed. What may have been more impressive however was his flawless perfection timing Carolina’s snap count and jumping over the line of scrimmage to try to block back-to-back field goal attempts at the end of the first half, even though both were negated by penalties. I may have to invest in another turkey leg next week, as I feel it could be Chancellor’s good luck charm in these playoffs. Turnover Battle: If it wasn’t for an overturned Earl Thomas interception, the Seahawks would have gone to the locker room at halftime up 3-0 in the turnover battle, and arguably could have had broken the game wide open instead of leading by just 4 points. By game’s end, the Seahawks had their third turnover, and ended the game +3 in turnover differential. The Seahawks turned these three turnovers into 14 of their 31 points. Thoughts on Carolina: The biggest area I thought the Panthers would struggle in this week was handling the crowd noise. Overall, I was impressed with quarterback Cam Newton’s ability to handle the noise but his decision making in the passing game was questionable. Nevertheless I see potential for Newton to improve in the offseason and be much better next season. The Panthers need to get back to playing more consistent defense next season. With as sloppy as the NFC South was in 2014, I believe that 9 wins could win that division in 2015. At this point I believe that the Carolina Panthers should be the favorites next season to win their 3rd straight division title. Random Thoughts: I love primetime football and I am really glad that the fog and mist made it seem darker right before kickoff… The streamers were once again a huge success but since Marshawn Lynch didn’t score a touchdown the Skittles I brought were used as a snack instead of a celebratory prop… Back to the Bam Bam Kam turkey leg for a quick second, it was $10 but there was probably only $7 worth of turkey on it. It was not like a Disneyland turkey leg which tastes more like corned beef. This turkey leg was clearly turkey but it was surprisingly flavorful. I would recommend it but to a big guy like me it is more of a snack instead of a meal… The rally towels looked amazing and more people waved them than at the NFC Championship Game last season. I hope they stick around for next week’s game… I hate that next week’s game starts at noon. That start time is unusual for all Seahawks fans since the earliest a game can start in Seattle in the regular season is 1:05pm. I have been to 2 Seahawks games in other cities that start at noon so I personally should be good to go. It will be interesting however to get to the bars around 8am, which will by far be the earliest time for me this season. Next week’s matchup has been set. The Seahawks will host the Green Bay Packers in the NFC Championship Game at CenturyLink Field next Sunday. Check back Saturday for my preview of that game. Go Seahawks! After a rough start, the Seahawks took control and never looked back. 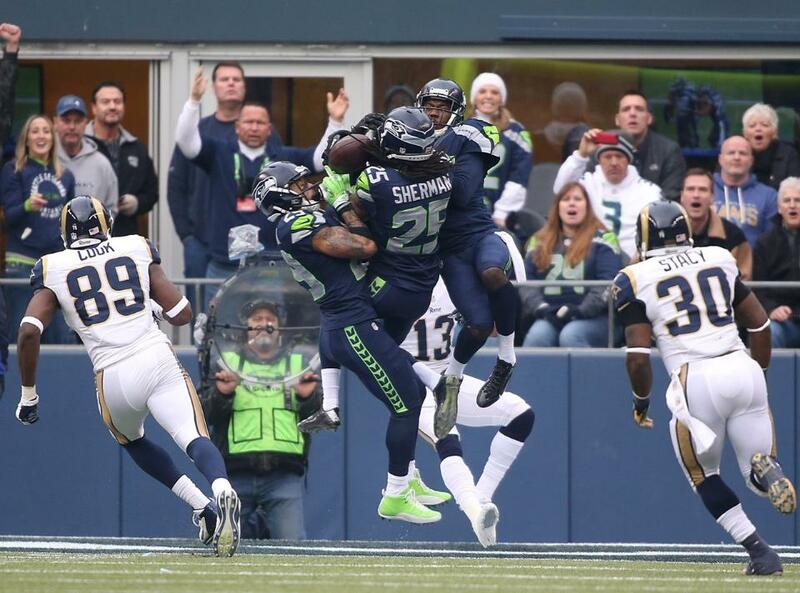 The Seahawks scored 20 unanswered points and defeated the St. Louis Rams 20-6 on Sunday afternoon. 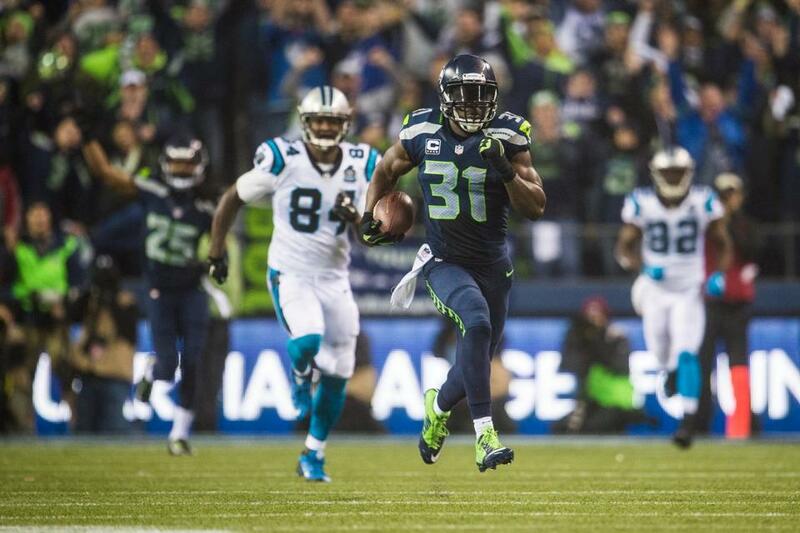 The Seahawks finish the season 12-4 and are the 2014 NFC West champions. The road to Super Bowl XLIX is now guaranteed to go through CenturyLink Field. Before we look ahead two weeks from now to our NFC Divisional playoff matchup, here are some brief thoughts about what I took out of this week’s game. First Half Turnover Differential: After the first 30 minutes of the game the Rams led the turnover differential 2-0. St. Louis took a 6-0 lead into the half. If this game does not prove the importance of turnover differential I do not have a better example. A Russell Wilson interception and a Marshawn Lynch fumble gave St. Louis short fields to work with which ultimately resulted in 6 points. This game was completely controlled by the Rams through the first half. Two questionable calls on fourth down by the Seahawks contributed to St. Louis’s control of the first half. Rams quarterback Shaun Hill did not play anything like how he played the previous two weeks, playing conservative football which was effective in moving the ball into scoring range. Although the Seattle defense held St. Louis to 6 points in the first half and although the fans in attendance felt fully confident in the Seahawks chances of coming back, the first Seattle shutout offensive through the first half since 2011 showed how taking care of the ball can make the difference between controlling the game and trailing to an inferior opponent. Hill, Irvin Change the Game: The Seahawks evened up the turnover battle in the fourth quarter with two huge plays. Jordan Hill intercepted a Shaun Hill pass which looked to be a busted play and throw into the ground with 14:51 left in the game. That play led to a Marshawn Lynch touchdown and a 13-6 Seahawks lead. 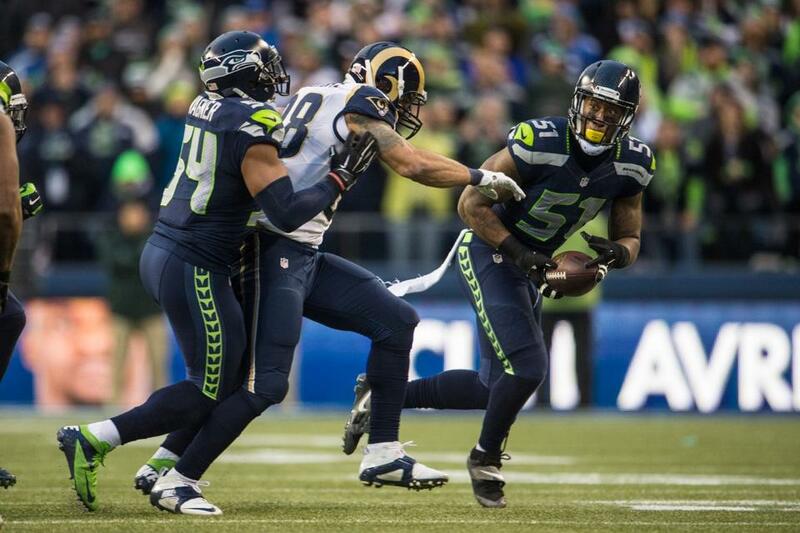 The play of the game was made by defense end Bruce Irvin. Irvin intercepted a Shaun Hill pass two series later which he returned for a touchdown, giving the Seahawks a controlling and deciding 20-6 lead. The Seahawks have allowed only three touchdowns in their past 6 games and after the pick-six by Irvin it was all but assured the Seahawks would win this game. The Seahawks defense has been playing at a level that I have never seen. 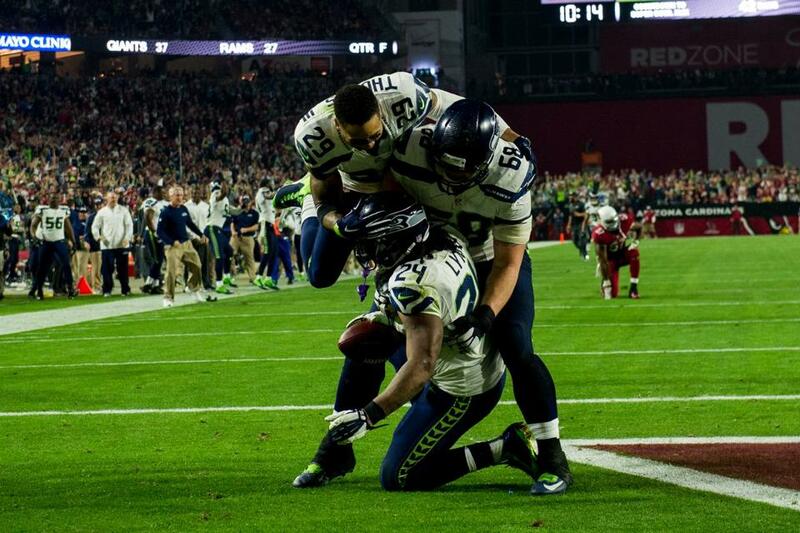 With the playoffs coming through CenturyLink Field, I would be shocked if this defensive play does not continue. 12th Man Heats up in Second Half: Two weeks ago against the San Francisco 49ers, I noted on my Facebook that the 12th Man treated the first half of that game like it did not mean anything. This week however, the 12’s brought the noise nonstop throughout the game. I was thoroughly impressed with the fans in attendance this week. They knew what was on the line and especially once the Seahawks took the lead the 12’s made sure the Rams had no shot getting back into this game. With the playoffs on the horizon, I expect nothing less than deafening decibels this January. Random Thoughts: Maybe I should stop adding commentary about the opposing team’s uniforms. The Rams went with the white jersey/navy pant combo instead of the all-white look this week. That is the second straight week I have been wrong about our opponent’s uniforms. It didn’t help their chances though… The fish and chips at the Pyramid Alehouse do not disappoint at all. Add a Pyramid hefeweizen to the meal? Flawless. A very underrated way to spend time before the game and something I enjoy doing once per season… One of the few places I enjoy drinking Mac n’ Jacks is Safeco Field, which is where I went after lunch. I recommend “The Pen” for any group who cannot get into a neighboring bar (if you have kids for example)… Two groups of people around me got ejected this week; a guy in an Aaron Rodgers Packers jersey two rows behind me, and a guy who sits one row in front of and two seats across from me. The Packers fan fell and almost knocked me over, and he made one of the girls in the row directly behind me cry. The Seahawks fan in the row in front of me was throwing peanuts at fans coming up the aisle at halftime. Idiots… This is about to be a very exciting January. Seahawks Playoff Outlook: The Seahawks have clinched the NFC West title and home-field advantage throughout the NFC Playoffs. 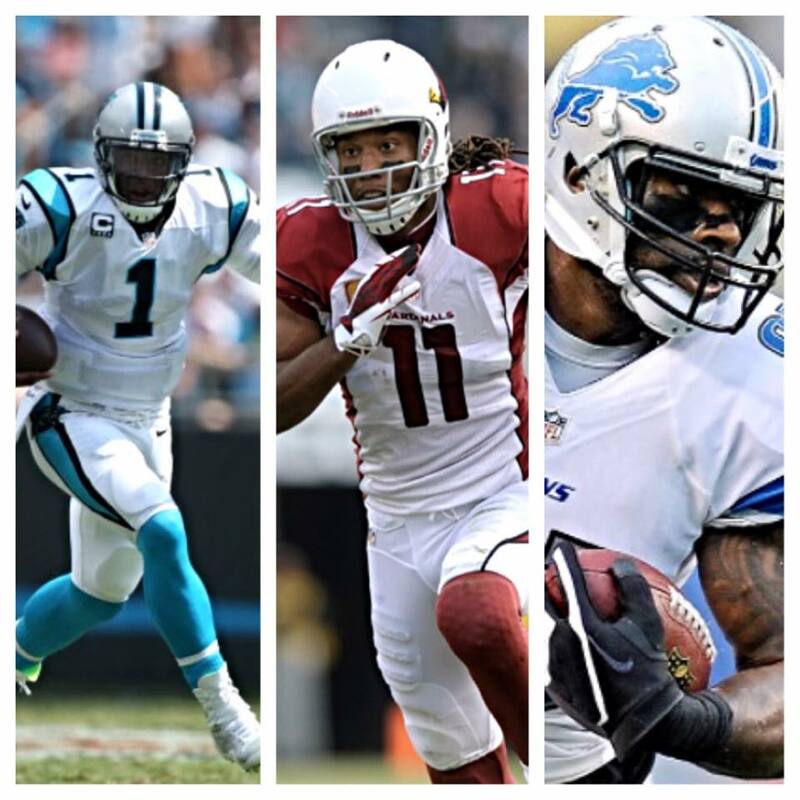 Seattle will host the Carolina Panthers, Arizona Cardinals, or Detroit Lions in the NFC Divisional Playoffs on Saturday, January 10th at 5:15pm. Check back later this week as I provide commentary on these three potential opponents and shed light on who I would most like to face in two weeks. Go Seahawks!